So with a leak down test that negative, and thinking I heard air coming from the oil pan, I decided the probable cause was weak piston rings letting the combustion gasses into the crank case. Next step, take the engine off the tractor! Taking a peak inside was pretty disturbing/ The cylinders appeared to be in great shape, but the piston head was a bit… neglected? The cylinder head had quite a bit of carbon build up I’d need to clean off. You can also notice on the right side of the head oil stains from where the head gasket was not sealing correctly against the engine block. A possible culprit to the starting issues! This would also mean I incorrectly diagnosed the issue as worn pistons rings. This is more likely where the issue is stemming from. The top of the piston, however, was in roughed up shape. It looked like something had been sucked in through the intake and bounced around for a while! The intake valve was in good condition. It made a proper seal. I cleaned off some of the carbon on the shaft but didn’t think any lapping would be required. The exhaust valve was in worse condition. The bottom of the valve had something slimy on it that elbow grease and an ultrasonic cleaner was unable to remove. I’d have to take a wire brush to it in order to clean it off. The seats were in good condition, no scratches or blemishes that could keep the valves from seating properly. The head after a little bit of cleanup. You can see here where whatever was hitting the top of the piston also hit the bottom of the head. The head gasket on the Kohler Command engines before 2003 was a rather poor design. The new gasket design is much more substantial. I decided that since the engine was already disassembled I would go ahead and replace the head gasket on the other cylinder at the same time even though it isn’t having any issues right now. More experienced people that myself also recommended cleaning the valves as those are the normal culprits to poor performance with the Kohler Command engines. to complete the engine winterization process. 6 feet ended up being near exactly the mount of fuel line I needed to replace every piece of fuel lines from the tank to the carburetor. Got everything back together, and accidentally broke the oil pump! Ordered a new one off of ebay, waited a week, and got everything running again! I took the carburetor apart again to look for any remnants of dirt or gunk in jets or passageways. Unable to find anything wrong, I decided to purchase a cheap knock-off replacement carburetor from Amazon to rule fuel issues out of the equation. After receiving the new carburetor I found I was still experiencing the same issues. The only other troubleshooting steps I could think of would be the coils. The Kohler Command twin engines were manufactured with “smart spark” modules that adjusted the spark timing to improve engine performance. 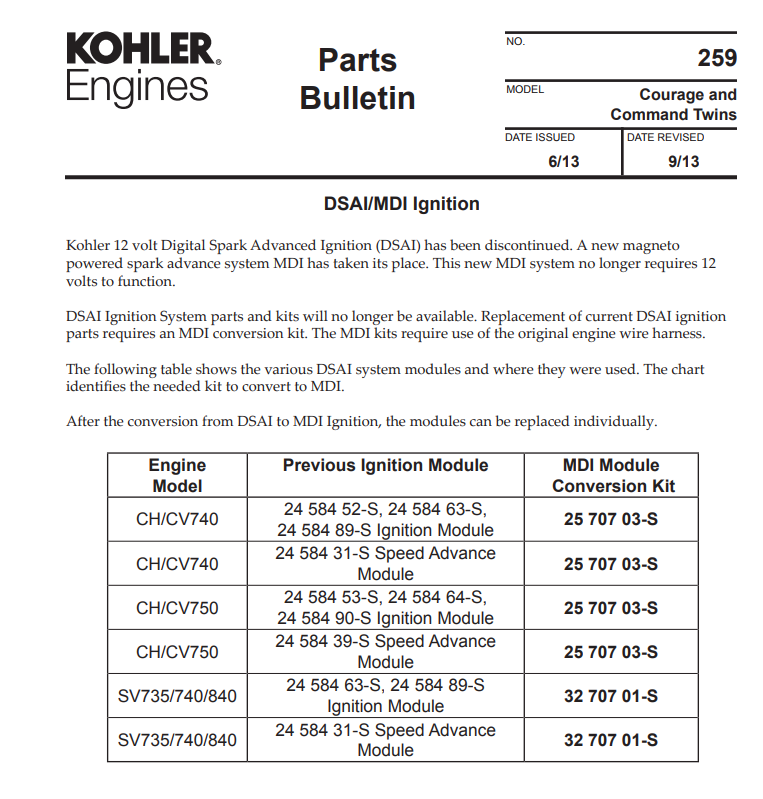 Kohler released a parts bulletin back in 2013 stating the entire spark system was being obsoleted for a different version of coils. I found other videos on youtube stating similar symptoms, so I decided to replace yet another part, the Kohler 25-707-03-S kit. Unfortunately, after replacing the entire ignition system and flywheel the problem persisted. After another leakdown test the intake valve on the number one cylinder was still leaking. It was time to turn to the professionals. I took the cylinder head to a local small engine shop to get it properly cleaned. Unfortunately again, not even the pros could do it correctly, after reassembling the engine the problem still persisted.